It's not just a chessboard - it's a work of art! Straight Up Chess now comes in a variety of sizes! To determine which size Straight Up Chess is ideal for your chess pieces, select the board whose square size is either EQUAL OR SLIGHTLY LARGER than the height of the King from your set. 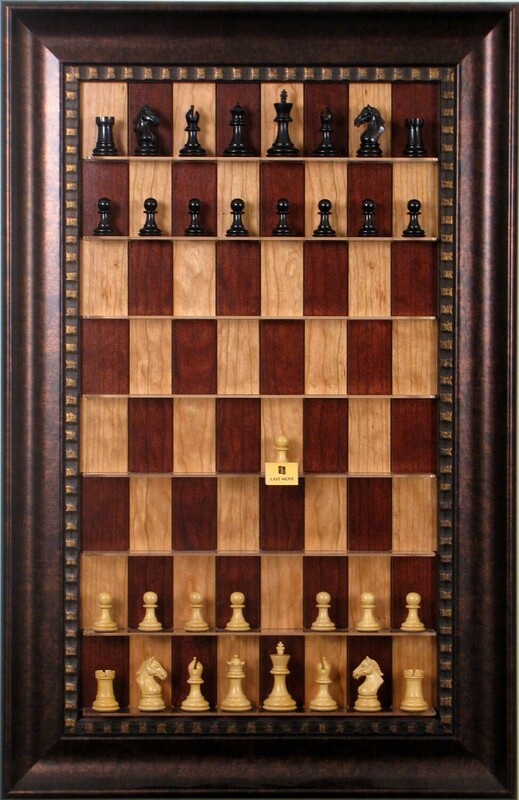 For example, if you own a Zagreb ’59 Series Chess Pieces, which has a 3.875” King, you would want to select the 4.0” Straight Up Chess Board. If you have any questions, please feel free to contact us for more information! Let the game begin! Before too long, you'll be hooked on your Straight Up Chess board. "Artistic", "beautiful", "classy", "fun", "a great conversation piece" are just some of the things that customers have used to describe Straight Up Chess. They're a great way to bring a little chess excitement into your busy schedule and connect with friend, family and co-workers. They're sure to be the center of attention in your office, game room, library, family room, dorm room or any room! They're as FUN as they are FUNCTIONAL! Note: The chessmen shown in the above picture are for demonstration purposes only and must be purchased separately. 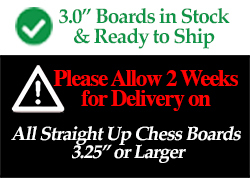 All Straight Up Chess Boards with a 3.25" Height or Larger are made on a custom-order basis. Please allow up to 2 weeks to ship. 3.00" Squares - 34" x 22"
, 3.25" Squares - 36" x 23"
, 3.50" Squares - 38" x 24"
, 3.75" Squares - 40" x 25"
, 4.00" Squares - 42" x 26"
, 4.25" Squares - 44" x 27"
, 4.50" Squares - 46" x 28"